Can't believe it's been a year. In honor of our beautiful Rudy, a re-post. It is bleak in our house today. Black and somber. Our eyes are red from the crying that comes spontaneously and without warning. Like right now as I write this. You see, our beloved dog, Rudy, had to be put to sleep. He had stopped moving, stopped caring. In the last few months he seemed to go from "old" to "ancient." The grief is heavy and comes from so many different places. As a human, the most basic part of the grief, for me, comes from my love of the dog. It seems he has always been here, sitting at our feet when we despaired, wiggling his entire being when we were joyous. But it was his old-man like wisdom that I think I will miss the most. He just knew...he just knew. For instance, last summer I was massively pregnant and on bed rest. There was major construction going on in our house so I had to stay in our claustrophobic master bedroom for days on end. Bathroom, bedroom, bathroom bedroom, until I thought I'd go stir crazy. One particular day when I was feeling completely miserable, depressed and very lonely, my bedroom door opened a crack. I was astonished to see Rudy's head peak around the corner. He wasn't allowed in our bedroom typically and after living with us for 12 years, rarely even ventured down the hall. But there he was sitting at the foot of my bed. Even more astonishing was what happened next. Despite his arthritic legs and cloudy eyes, Rudy found the energy to bound puppy-like up on to the bed with me. He nuzzled my chest, harrumphed and sneezed, and didn't leave my side for two days. He knew. He just knew. I needed company and company was what he gave. The absence of that wisdom, that loyalty, leaves a hole in my heart. As our day of grieving wore on I found that like the grass, topsoil and sediment dug up in our backyard to make Rudy's final resting place, my grief had layers. It seemed the deeper the layer the more pain it held, the kind of pain only a parent could identify with. Worse than the mourning I felt for the death of the dog, the deeper layers housed the anguish for the devastation that my family was feeling. As a wife, the mixture of pride and sadness that I have for Jeffrey leaves an incurable ache in my stomach. Watching him pretend to be strong as he led his precious Rudy to the car for his last ride, seeing him carry Rudy wrapped in the blanket to his grave in our backyard, witnessing him break down as he recalled the moment that Rudy died in his arms-well to put it simply-put a crack in my heart. But the deepest layer, the worst part of today, tomorrow, perhaps for the long run, was seeing my boys, those macho-never-cry little guys fall apart at the seams. True to their differences, the way they grieve is night and day. Aidan cried easily, but rationalized. He said late last night, "It would be cruel to let him suffer." His anguish was on the surface and consistent. In spite of his pain, he was able to think of others as well. As much as it hurt him, he stood by his step-father's side as he buried Rudy, the dog that bonded them in the beginning of their relationship. Gannan, on the other hand, had been quiet, absolutely silent since he found out that Rudy would be leaving us. It wasn't until just before Jeff took him to the vet's that he broke down. He wailed, begged us not to take him away. His own agony was too much for him to take. He painfully lamented that he'd never be able to play in the backyard again knowing that Rudy's grave was there. But in the end, before our dog was buried, Gannan brought his prize possession to me, a second place ribbon that he won at the largest cross country event he ran in this fall. He said he wanted Rudy to have it, to remember the running they did. It was at that moment, that my heart gave out under the weight of the grief and instead of a simple crack, it broke into a million pieces. A very smart, but anonymous person once said, "A mother is a bank where we deposit all our hurts and worries." Today the mom-account was filled. Today I found out what all mothers eventually come to know: when bad things happen, mothers not only have to be able to shoulder their own grief, but they will need to muster extra strength to carry around the sadness that comes from watching their families grieve as well. So poetic and beautiful Logan....my condolences to yur and your family. I'm so sorry for your loss. I know exactly what you are going through, and I am crying with you. We had our 16-year-old dog put to sleep last year, and it absolutely broke our hearts. You are in my thoughts and prayers. Logan, I too had to put down my dog after about 14yrs together. He too was old and when Jack was 4 months old the day had come. He was just too old to carry on. I'm not a religious person however I do think God had a plan, one replaced the other. For a long time it was just me and Max, now it's just me and Jack. At the time I felt guilty, but I now see it was the kindest thing I could have done for him. I still miss him and sometimes call Jack, Max in a story and vice versa. Death is an unfortunate part of life but we grieve, move on and take with us a lifetime of wonderful memories nobody can EVER take away! Oh my god! RIP Rudy! I am so glad I was able to meet you!He is now over rainbow bridge where he is running and playing with all his friends! He will never forget you!You all gave him a wonderful life! I havn't yet had to deal with the death of one of our furry family members. However, abuot a month ago, my cloey, 7 year old chiwa wa, became very ill.. for the first time since i bought her. She had to be hospitalized! For the first time, I knew emotinally how bonded I was to her. My heart was very heavy and I prayed she would not die. I felt heart sick for the 2 days she was being nursed back to health. Thank fully, she recovered from whatever the illness was (they wern't able to pin point an exact problem), she recovered. It is amazing how emotionally bonded we become to our pets. They provide for us a joy and happiness that is ever lasting. If something were to have happened and she passed on, there would have been tremendous devistation in our home. I have a newly founded appreciation and love for cloey that I took for granted all these years. I pray for you and your family. Maybe in time, there will be room for another furry family member, who will captivate your hearts as rudy did. 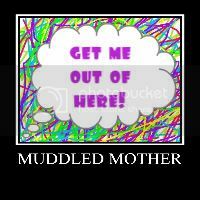 Muddled Mother of 4!! Thanks for your comments! Please join our site by clicking on the word "follower" on the right hand side. You'll be notified of new postings! Thanks for the positive comments!